The stability ball is one of the most effective low-tech devices and a staple that all instructors should know how to use effectively. Get introduced to valuable new conditioning exercises to add to your repertoire. The course provides stability ball exercises that you can adapt for beginner, intermediate and advanced levels of clients. This step-by-step Specialist Course allows you to take a beginner through the training process by breaking down moves to the simplest form to establish flexibility and strength. Then use the innovative exercise ball techniques and advanced positioning for your more advanced clients. This Speciality Certificate Credential provides all the tools, exercises, instructional awareness cues and positioning techniques to communicate and create a solid program for clients to strengthen their legs and core and work on balance. ✓ Gain insight on beginner to more advanced stabilization techniques. 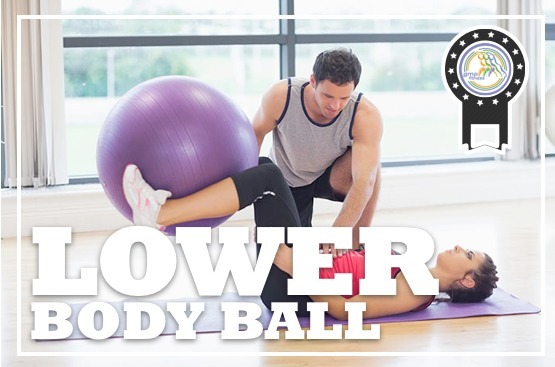 ✓ Amplify knowledge of lower body ball exercises and how to set proper intensity levels. ✓ Find out appropriate guidelines and instructional tips when using the stability ball. ✓ Learn the muscles being used when performing the conditioning moves. ✓ Review guidelines when using the stability ball to the lower body. ✓ Learn new ideas on how to stretch. ✓ Provide appropriate instructional cues for proper exercise technique. ✓ Enhance knowledge on the benefits of using the stability ball. ✓ Learn to progress through exercises moving from basic to more difficult through body position changes. ✓ Apply and incorporate stability ball training for the lower body and some additional exercises for the torso.